Halim Malkoč (12 August 1917 – 8 February 1947) was a Bosniak Imam and SS Obersturmführer in the Waffen-SS division Handschar, was the first Muslim awarded the German Iron Cross during World War II. He received the medal for his involvement in the suppression of the Villefranche-de-Rouergue mutiny of 1943. Malkoč was a young Imam in Bosnia when the war broke out. He "had served on active duty as an officer in the Yugoslav army and was a gifted military leader." In 1943 he joined the newly formed Waffen-SS Division "Handschar" and was initially appointed an Imam to the "SS-Gebirgs-Pioneer Bataillion 13". 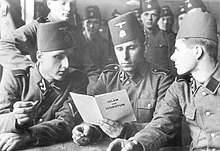 In July he and several other Bosnian ulema were sent to Dresden for an important three week "Imam Training Course" organised by SS Obergruppenführer Gottlob Berger and honorary SS officer Mohammad Amin al-Husayni, the Grand Mufti of Jerusalem. Classes included lessons on "The Waffen-SS: Its Organization and Ranks" and German language tuition. There were also excursions to the Berlin Opera and the Babelsberg castle, Potsdam and the Nicholaisee. During training, Communist "agents provocateurs" in the Division staged a mutiny on 17 September near Villefranche-de-Rouergue in France in which several SS officers were executed. A German called Dr. Schweiger turned to Malkoč for help. The Imam eventually persuading the men to surrender and disarm. A report stated, "To complete this task the doctor sought the assistance of Imam Malkoč, who proved to be quite helpful, demanding complete obedience from the troops." In recognition of his services he was awarded the Iron Cross, second Class, in October 1943. A year later he was appointed Imam for the entire Division after the first appointee, Imam Abdulah Muhasilović, deserted on 21 October 1944. After the war, the new Communist government in Yugoslavia hanged Malkoč in Bihać on 8 February 1947. ^ George Lepre, "Himmler's Bosnian Division; The Handschar Division 1943-1945" (1997), p. 72. ^ George Lepre, "Himmler's Bosnian Division; The Handschar Division 1943-1945" (1997), p. 94. Redžić, Enver, “Muslimansko Autonomastvo I 13. SS Divizija". Sarajevo: Svjetlost, 1987. This page was last edited on 31 March 2019, at 17:42 (UTC).